Why Moraga is a Great Place to Live! Where are the best cities to live in the Bay Area? They are cities with high quality local schools, employment opportunities, access to amenities, and low crime rates. Nestled in the beautiful hillsides of the East Bay, Moraga ticks all those boxes and more. Moraga is in the heart of the East Bay and is close to Walnut Creek, Berkley, San Francisco and Oakland. Highway 24 connects Moraga to the rest of the Bay Area and is between two BART stations, making it easy to commute to the city center. With small town charm and a wonderful sense of community, Moraga is a wonderful place to raise a family. Moraga boasts an enviable combination of top-rated schools and college-educated residents who support education. Parents, community members and local business partners work together to help support the Moraga School District through the Moraga Education Foundation (MEF), whose goal is to support the educational experience of Moraga students through endowments (SummerHill Housing Group is a proud Foundation Hero). Moraga is also home to Saint Mary’s College of California. In addition to the high-quality schools in the area, there a lot of community programs, sports and other activities for the entire family. 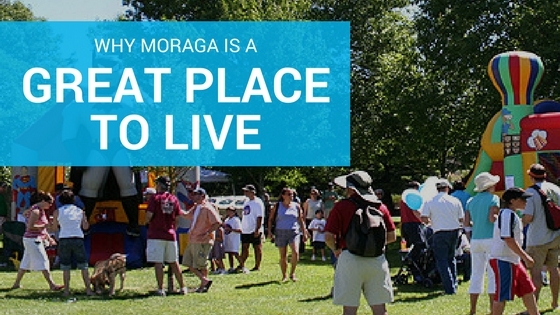 The Moraga Parks and Recreation Department offers several programs and activities for residents of all ages. There are also several parks, including Moraga Commons, Hacienda de Las Flores, and a plethora of walking, biking and hiking trails around town. Additional shopping, dining and recreational activities are a short drive away in neighboring Orinda, Lafayette and Walnut Creek. If you want to make Moraga home, check out our available homes at Harvest Court or sign up to stay updated on Bellavista, coming to Moraga this Fall.